From left, top Stephen Bauman and Zachary Brawley; and bottom David French and Madison Whitby. Four students affiliated with University of Arkansas students – two graduate and two undergraduate – will spend the summer interning with the U.S. Navy at the Naval Research Laboratory in Washington, D.C., and the Space and Naval Warfare Systems Center Pacific in San Diego. 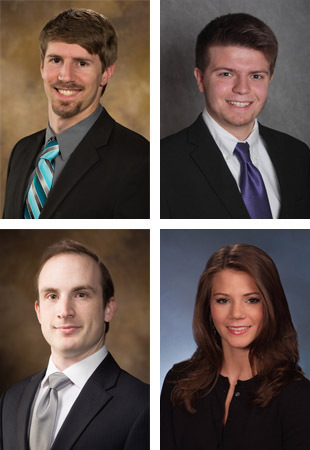 Graduate students David French and Stephen Bauman, as well as undergraduate sophomore Madison Whitby, are full-time students at the University of Arkansas. Undergraduate senior Zachary Brawley, a student at the University of Central Arkansas in Conway, performed a Research Experience for Undergraduates at the U of A in the Department of Physics last summer. All four students are active members of a research group led by Joseph Herzog, an assistant professor in the Department of Physics. French is a doctoral candidate in the Department of Physics. Bauman, who earned his master of science in microelectronics-photonics, is pursuing a doctorate in the same field. Whitby is a double major in mechanical engineering and physics. Brawley will graduate this spring from the Department of Physics and Astronomy at Central Arkansas and plans to begin graduate school in the fall. French will intern at the Space and Naval Warfare Systems Center Pacific, where he will work on ultrashort, pulsed, laser-beam control. Bauman, Whitby and Brawley will all be working at the Naval Research Laboratory in their respective 10-week programs. Bauman will work on a project involving coupling plasmonics and 2-D materials. Whitby and Brawley will work in the same laboratory, studying fiber-optic acoustic sensors. "I am proud of these students," said Herzog. "They have done excellent research in my lab, and I am confident they will contribute to the research needs of the U.S. Navy and the Office of Naval Research." The internships are facilitated by the Naval Research Enterprise Intern Program through the Office of Naval Research and American Society for Engineering Education. As stated on the program website, "This ten-week intern program is designed to provide opportunities for undergraduate and graduate students to participate in research, under the guidance of an appropriate mentor, at a participating Navy laboratory."